Network Extender for Business can enhance your business’ wireless coverage within your building. It will help ensure that you and your employees can always access the top data speeds and the best calling connection available through our wireless network. Wall and Ceiling Mount Installation Guide (PDF*) – Learn how to position and install your unit to receive the best possible signal. Where can I use the Network Extender for Business? The Network Extender for Business works in many places within the Verizon Wireless coverage area but not outside the US. To find out if a Network Extender for Business will enhance coverage in your location, visit a Verizon Wireless store or click the Chat with us button at the bottom right corner of this page to contact one of our representatives. 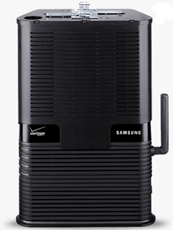 Note: The Network Extender for Business can enhance your calling or 3G data coverage. It’s not designed to enhance 4G LTE data coverage. What type of Internet connection do I need for the Network Extender for Business? The Network Extender for Business will work with connections that provide a minimum broadband speed of 3.5 Mbps. The Network Extender for Business is not supported for use with satellite Internet or wireless broadband service, such as our Mobile Broadband service. You can purchase the Network Extender for Business by logging in to your business online portal. Note: You must have purchasing capabilities activated on your account to make an online purchase. Contact your Wireless Program Administrator for assistance.